Result is the only thing that counts, or is it? Are you willing to fire your business & IT employees, and replace them with top players? Are you willing to replace yourself with someone who can do a better job? There is always someone who is better at the job than you! Why are you blocking the winning result for your company? Is it the result that has been delivered which counts in the end? 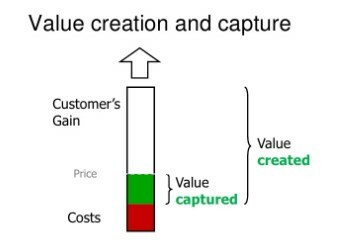 Is it not the real result, that “thing” that delivers value to the one that receives the result? Are you still with me? The previous statement is the big “mind” shift that makes all the difference. The result is just a “means to an end” where the end is the value that it delivers. 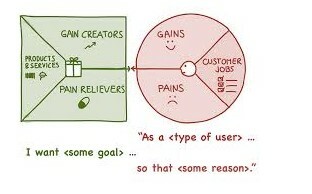 The Value Proposition Canvas by Osterwalder visualizes this. For the customer, the result is the shifted balance between pain & gain, and a positive change is the only thing that counts. Is value not the difference in (value) perception of a person between the current situation and the old situation? On Wikipedia, the first definition uses the word ΅prospective” and in the second one it refers to the perceived benefits in the now. The current world is more agile because of the world shifting to a network society and thus developing at a higher pace. Enterprise strategies and programs with a scope of more than two years are getting very rare because it is impossible to predict what is happening. A rule of thumb, I use is that when you have a project that cannot deliver value within six months, you are running a great risk of failure. We can safely say that result is about providing improvement and not proving that improvement is possible. The key factor here is the word perception in the term “value perception”. Perception is something that is unique for every individual. This implies that when you want to define value, you need to take into consideration that there are various value perceptions involved. The most basic difference in perception is the value that one producer perceives and the value the one customer perceives. So when the result is just a “means to an end” with the end being the value that it delivers. If we want to optimize value for a person, then we need to continuously improve the value perception. Following the reasoning above, I think that this implies that the essence of every request for the result is the request for implementing continuous improvement. I am starting to be convinced that every other approach in the creation or change process leads to failure. When you do not aim for continuous improvement, but only for a one-time improvement, you are aiming for a static result. This static result can only be achieved when you freeze the system of value perception and the various persons that perceive. Since everybody and each of their contexts are changing non-stop, this freeze is impossible. When you do not aim for continuous improvement but only for a result in the form of a product or “thing” then you know for certain that every person involved will perceive the added value as less and less when the time continues. The reason for this decline in value perception is that people are getting used to the image of the presented goal. “Seen that, been there” will be over time the overall unconscious perception of the people involved. This is natural behaviour of people to get used to situations in general.